I have to go to the doctor tomorrow. Usually I try to set things up so that I have to do things on my days off, so as not to hinder comic production. I’m a creature of habbit, and like my life to be scheduled just so. When things happen outside of my structure it fills me with dread. I should be more worried about seeing the doctor, but having my little routine shaken is what bothers me. 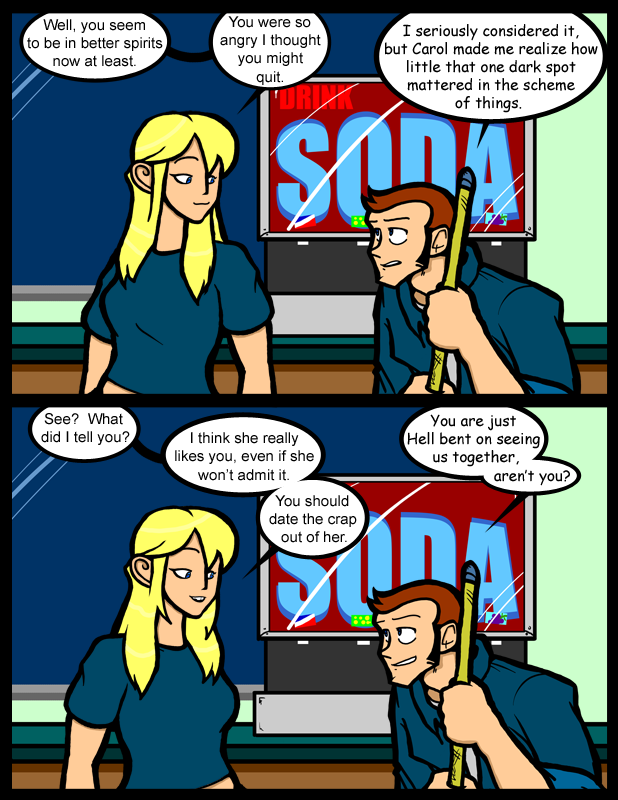 There was some question on DrunkDuck of what/how “date the crap out of” someone implied. I couldn’t agree to some of the terms and conditions of membership of Drunk Duck, but let me just say this: dating the crap out of someone could involve those loooooong hours spent just talking, enjoying each other’s company, not even noticing how much time has passed, until you suddenly and inexplicably have to be to work in an hour! That would definitely be dating an “Oh Crap!” out of someone. I love the dramatic irony here. This comic has life written all over it.